This interacting group contains several galaxies (called Arp 194), along with a "cosmic fountain" of stars, gas and dust that stretches over 100,000 light-years. Tocommemorate almost two decades of photographing the wonders of the universe,the Hubble Space Telescope captured an image of a peculiar group of interactinggalaxies that contains a "cosmic fountain" of stars, gas and dustthat stretches about 100,000 light years. 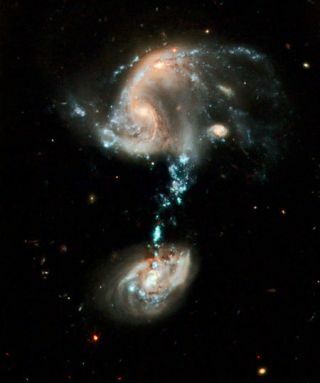 Over thepast 19 years, Hubblehas taken many imagesof galactic collisions and close encounters. The newimage of a trio of galaxies, called Arp 194, looks as if one of the galaxies hassprung a leak. The bright blue streamer seen in the image is really a stretchedspiral arm full of newborn blue stars. This stellar activity typically happenswhen two galaxies interact and gravitationally tug at each other. Hubble'sresolution shows clearly that the stream of material lies in front of thesouthern component of Arp 194, as shown by the dust that is silhouetted aroundthe star cluster complexes. Resemblinga pair of owl's eyes, the two nuclei of the colliding galaxies can be seen inthe process of merging at the upper left of the image. The bizarre blue bridgeof material extending out from the northern component looks as if it connectsto a third galaxy but in reality this galaxy is in the background and notconnected at all. The detailsof the interactions among the multiple galaxies that make up Arp 194 arecomplex. The system was most likely disrupted by a previous collision or closeencounter. The shapes of all the galaxies involved have been distorted by theirgravitational interactions with one another. Arp 194,located in the constellation of Cepheus, resides approximately 600 millionlight-years away from Earth. Arp 194 is one of thousands of interacting andmerging galaxies known in our nearby Universe. The newpicture was issued to celebrate the 19th anniversary of the launch of theHubble Space Telescope, a joint NASA/ESA venture, aboard the space shuttleDiscovery in 1990. Thelast planned servicing of the telescope is scheduled for May. Hubble hasmade more than 880,000 observations and snapped over 570,000 images of 29,000celestial objects over the past 19 years.